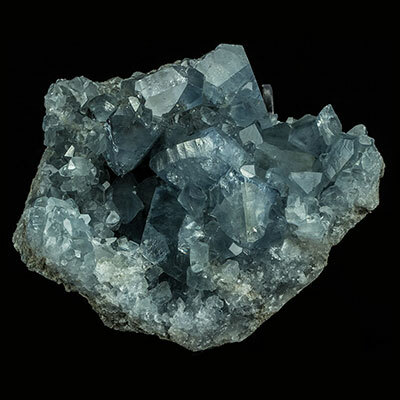 Celestite is a member of the Sulfate family. 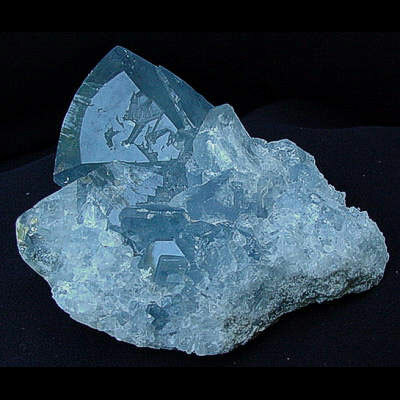 It comes in both massive (Angelite) and crystalline form, with color ranging from grey to sky blue. Read more about Celestite healing properties information and view beautiful photo galleries with high resolution photo below. 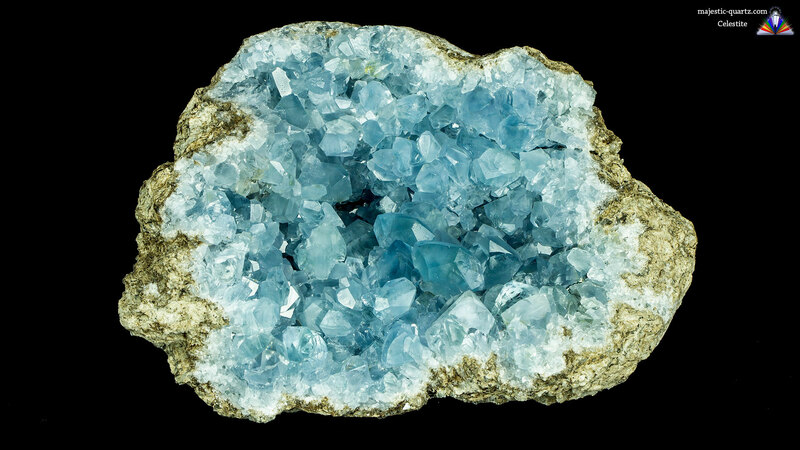 Celestite helps to put you above fear and negativity, and thus raises the general consciousness of the planet as a whole. It is also very useful to meditate with for people who are prone to self-sabotage. 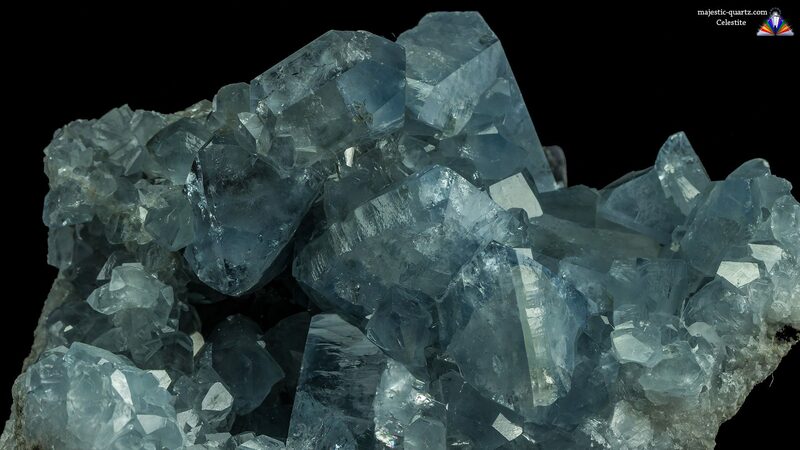 Click the Celestite Specimens below for a high resolution photo! 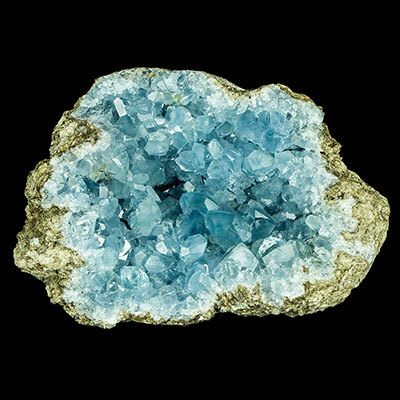 Do you have a personal experience, question or information pertaining to the crystal healing properties and meaning of Celestite? Please feel free to use the comments form below to share your knowledge with the Crystal Information encyclopedia. Please note, we moderate this feature to keep the site free from unwanted spam. Thank you for the reply, Anthony. As far as I know Angelite is CaSO4, while Celestite is SrSO4, hence heavier. Do you think all the dozens of "celestite" spheres offered in Ebay are empty inside? This would indeed explain a lower Specific Gravity. I have one of them, but I will not break it up to see if its empty inside! I also think its blue calcite. Aha, I apologize for not being more specific. The geodes are very obviously geodes from the outside. Theyare not the kind that you need to break open to see they are in fact a geode! I had a quick look at Ebay and I see immediately what you are talking about. 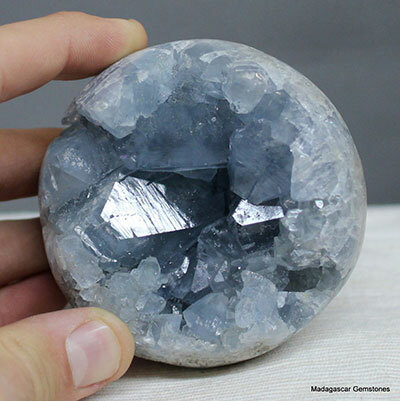 Here is an example link below of a REAL Celestite Geode Sphere. 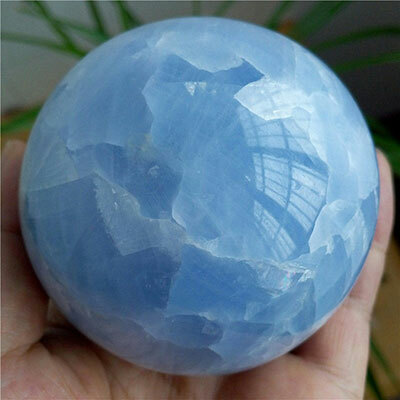 Here is a link below to a seller selling a Blue Calcite Sphere as being Celestite. I give the Sellers the benefit of the doubt as English is not their first language. 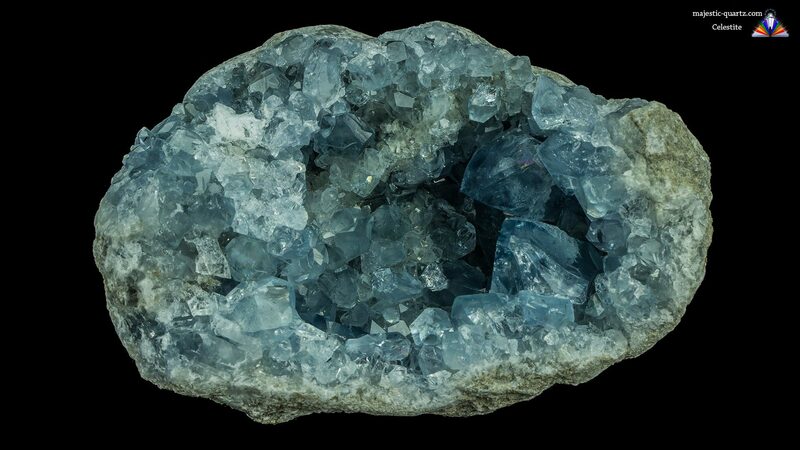 In this case, the Chinese dealer may have swapped some Chinese minerals with a dealer who had Blue Calcite from Madagascar – Who then told the Chinese dealer it was Celestite! Still I can´t understand why there is not one single massive that is whole sphere of Celestite on the market, why only open geodes. Strange, isn´t it? I was looking for a whole sphere of celestite when I discovered this mess. Your pictures are very helpful as they show clearly the difference in colour. It is because the Celestite is too brittle. The likely hood of it breaking up when trying to create the sphere would be very high in the extreme – so would not be worth the time and risk to attempt making them on a commercial basis. Are there any celestite spheres which are no fake? If you use the data from the sellers (weight and diameter) and calculate specific gravity, you get always 2.7 to 2.9 instead of the expected 3.9 to 4.0. How is this possible? Are they selling calcite, SG of calcite is 2.7? 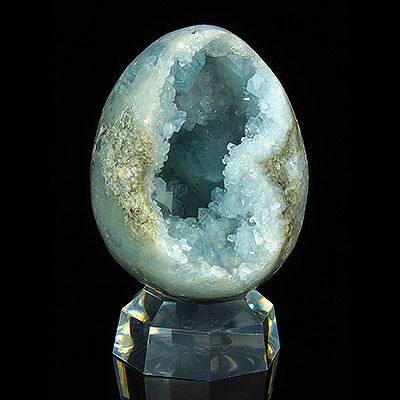 I would like to have a legit celestite sphere! The only Celestite Spheres I have ever seen are spheres shaped out of geodes, so it would be hard to measure specific gravity off the weight of them as they are essentially hollow. I have never seen a solid Celestite sphere ever – only the Angelite variety which is the massive “compressed” sort of Celestite. 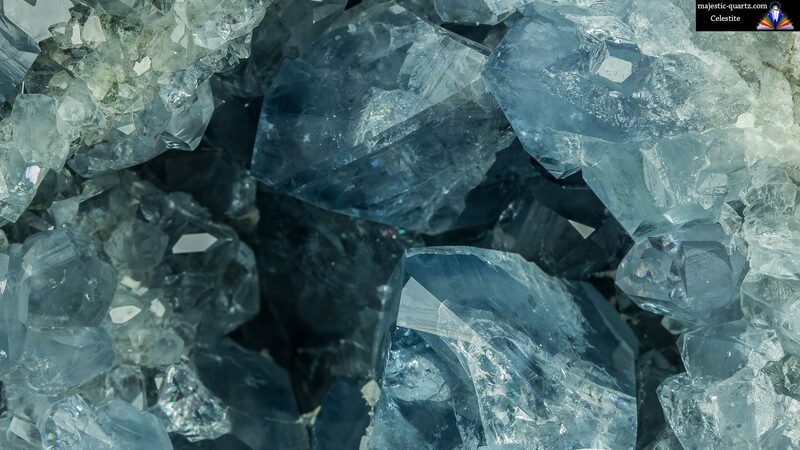 Without seeing an image, I’m going to say that it is entirely likely that yes, they are selling Blue Calcite as Celestite.